Not for the first time I find myself with an accidental thrifting theme - this time it's birds. 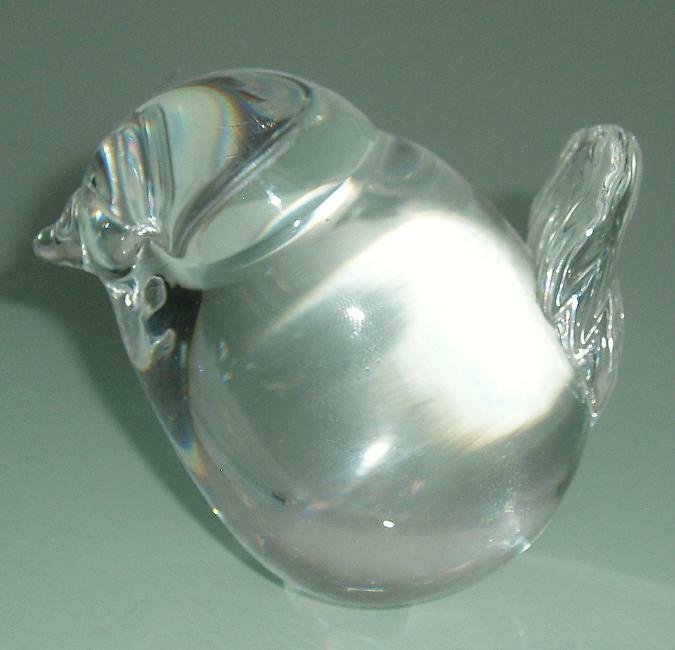 This lovely fat little crystal bird turned out to be made by Hadeland of Norway when I got it home and removed the price label from the bottom. I'm not normally a big fan of crystal, but this is such an attractive, simple shape. 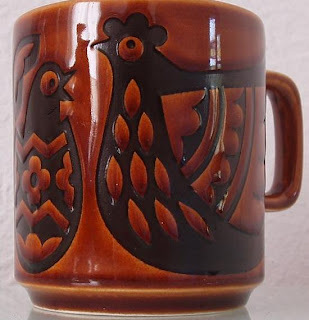 I am a big fan of John Clappison's designs, especially his animal mugs, so I was really happy to find this Hornsea chicken family mug. It must be 40+ years old, but the glaze is still as rich and glossy as new. This owl vase/pot is a bit of a mystery item, and I paid a bit more than my usual thrifting limit for it. Confession time : I was immediately drawn to it, not sure if it was the slightly John Clappison style of the design or the red lava-style glaze. I carried it around while I browsed the rest of the shop, decided it was too expensive and then hid it behind some books while I went to have a think about it. Does anyone else ever do that? Well, obviously I went back for it, having Googled it on my phone in the meantime and found no trace of it, therefore convincing myself that I was unlikely to ever find another one and would regret not buying it. It's made by the Tyn Llan pottery in Wales, but that's all I know. 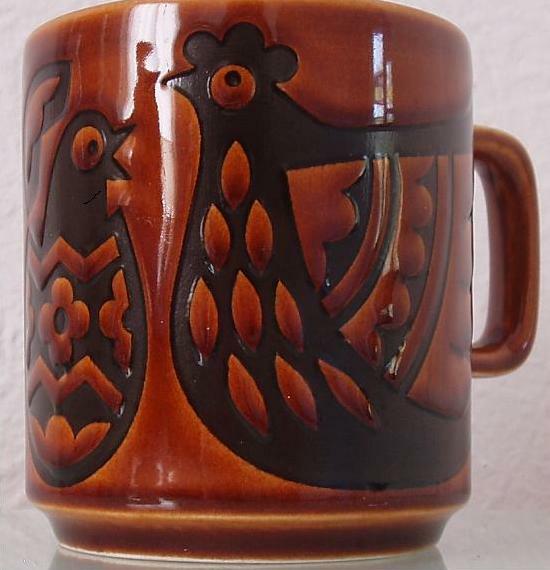 Googling has only brought up images of big chunky pottery mugs with Celtic knotwork designs - no animals. Any information gratefully received. I'm embarrassed to admit it, but yes, I have hidden things before to give myself time to think about whether I really want them or not. I'll admit it too! Hiding things I mean! Love the bird. I've got a similar looking glass one which is a paperweight and made by Wedgewood. Love the mug. I was very lucky to find two of those Clappison designed mugs at a jumble sale recently. Thanks, you two - nice to know it's not just me! I should have mentioned that if I'd decided against buying it I would have returned to the shop and put it back on the proper shelf. Loo, lovely find, I'm a little bit jealous! Beautiful, thank you for sharing. I always love peeling back labels and finding some unexpected information! Good to see you back! Clappison in a charity shop - gold-dust; you must have hit some lucky seam wherever you shop ;) And TKMaxx is like that too, the hiding things behind other things - always look at the back of shelves as that's where the best bits can be. 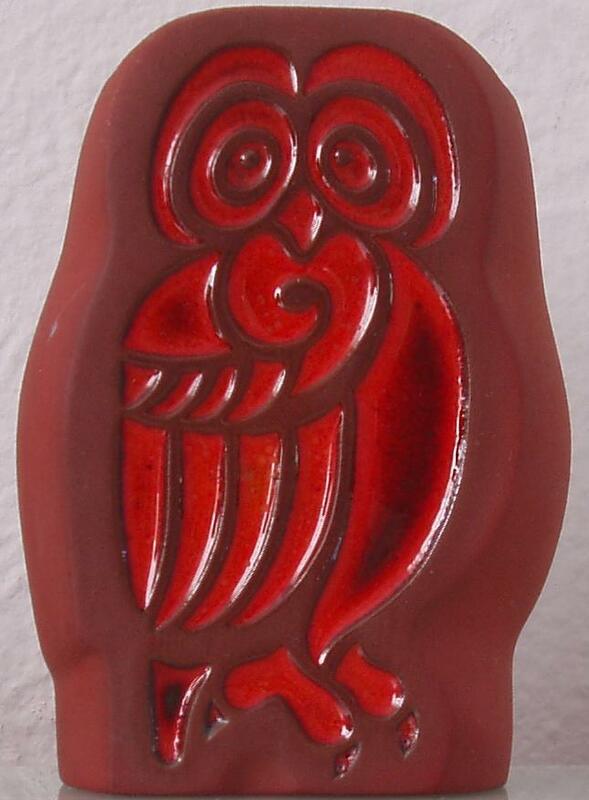 This Owl was made by Trevor and Hazel Leese at Tyn Llan Pottery, Tremadog, North Wales. There are many other designs of pottery they did including a stand up Owl among others. Many items come up on eBay. Search under Tyn Llan.